MONTEBELLO >> An improperly secured cargo container slipped from a big rig Saturday, knocking down a power pole and shearing a fire hydrant on Telegraph Road in Montebello, authorities said. The mishap occurred about 4:30 p.m. on Telegraph Road, just west of Gage Road, Montebello police officials said. A big rig had just pulled out of a nearby business when the metal cargo container loaded on the back slipped, Lt. Julio Calleros said. The driver was unhurt, he said. 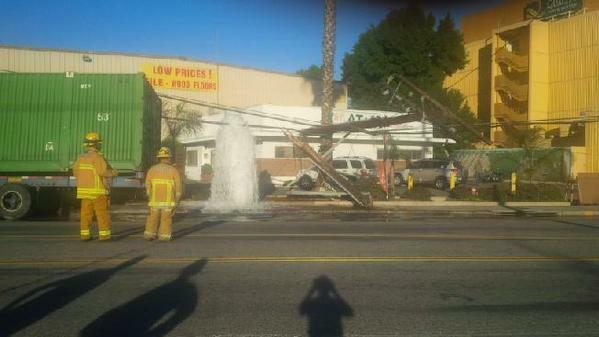 A geyser erupted from the damaged fire hydrants, and power lines fell to the street, he said. The accident knocked out power to the nearby Quality Inn & Suites, trapping several people inside elevators, but the electricity was restored within minutes, Calleros said. The eastbound lanes of Telegraph Road remained shut down early Saturday evening, though the westbound lanes were closed as workers repaired the damage, police said. PHOTO courtesy of the Montebello Police Department.